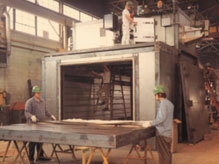 The oven being assembled in the photo is an example of a BATCH TYPE polymerization oven manufactured for an overseas automobile manufacturer. The customer is process curing styrene polymers in molding "presses". This two-zone oven is an IRI compliant, gas fired, 400°F unit, with a single lift door, plug fans for easy maintenance, and a (4) four-lane gravity roller conveyor. The customer specific options include (20) twenty workspace thermocouples for accurate thermal mapping. Included in that package were a chart recorder, and an OMEGA datalogger. Other specialty items were internal lighting, a sprinkler system, and 16 gauge aluminized drip pans under the gravity rollers. The approximate overall dimensions are 45 feet long X 16 feet wide X 18 feet high to the lift door frame.